This post is adapted from remarks MDC President David Dodson made on February 4 in Tempe, Arizona, to an audience of community college presidents, faculty, and administrators gathered for the American Association of Community College’s Pathways Project annual institute. As I considered my remarks for today, my thoughts went to an extraordinary new novel by Colson Whitehead, The Underground Railroad. It is a magical work. The historic Underground Railroad was a series of well-concealed way stations that gave sanctuary to enslaved Africans fleeing to freedom in the North. In Whitehead’s tale, the Railroad becomes an actual subterranean rail line, a marvel of technical engineering that literally burrows under the slave states of the antebellum South—a pathway to safety and salvation, complete with actual locomotives and rail cars. The stairs led onto a small platform. The black mouths of the gigantic tunnel opened at either end. It must have been twenty feet tall, walls lined with dark and light colored stones in an alternating pattern. The sheer industry that had made such a project possible. Cora and Caesar noticed the rails. Two steel rails ran the visible length of the tunnel, pinned into the dirt by wooden cross-ties. The steel ran south and north presumably, springing from some inconceivable source and shooting toward a miraculous terminus (pg. 67). But the path is still not easy for those who view it as the one great hope for their liberation. Rules of passage are mysterious—opaque for people who have spent their lives in the closed and cruel system of slavery on plantations. Trap doors and dead ends make the path perilous. For those who do get on the Railroad, like the novel’s heroine, Cora, the danger of being captured and returned to the plantation—and to violent punishment—is a constant reality. Cora is a young woman who has been brutalized in captivity. She is a third generation of her family to live in slavery. Her mother has run off from the plantation to seek her own freedom, leaving Cora to raise herself. Given a life of abandonment, forced to survive on the plantation by her own wit and native intelligence, Cora is relentless in her pursuit of freedom. She has escaped the plantation with Caesar, a brave fellow, also enslaved, who has seen glimpses of the wider world beyond the plantation and knows both the delights of freedom and the dangers involved in securing it. But Caesar is killed in a skirmish with a notorious slave catcher sent to find the duo. From that point, Cora persists to get to the railroad alone. By turns hopeful, terrified, confused she makes her way doggedly, alone. For Cora, the beautifully engineered path of the railroad is a strange gift. Nothing in her life has prepared her to navigate it. Throughout the novel, she is truly dependent on the kindness of strangers, like station agents and conductors, to get to safety. Station agents, who shepherd escapees to railway stops, pair their knowledge of the path with their courageous spirit to help the enslaved enter the pathway to the freedom. Conductors rely on their own lived experience and geographic expertise to lead the train away from the cruel system of slavery and toward a land where survival and autonomy could become Cora’s reality. The book follows Cora on her journey north from Georgia. The first stop on the railroad is South Carolina, a state that looks like the Promised Land, but in fact is a twilight zone of deception and cleverly concealed brutality. The next stop, North Carolina, possesses a culture of raw cruelty, where public lynchings are the occasions for picnics and band concerts in the town square. On Cora’s pathway to freedom, nothing is what it seems. Hope appears and then vanishes as each stopping point becomes a perverse mutation of the cruelty Cora has escaped on the plantation. The Underground Railroad is about the unconquerable, existential human drive for the dignity of a better life. It is about the essential role that a brilliantly engineered salvific pathway plays to deliver a young woman to freedom and the fulfillment of her dreams. It is about the station agents and fellow travelers without whose leadership, courage, guidance, and wisdom Cora’s aspirations and even the pathway itself would have been insufficient to deliver a young enslaved girl to the threshold of freedom. 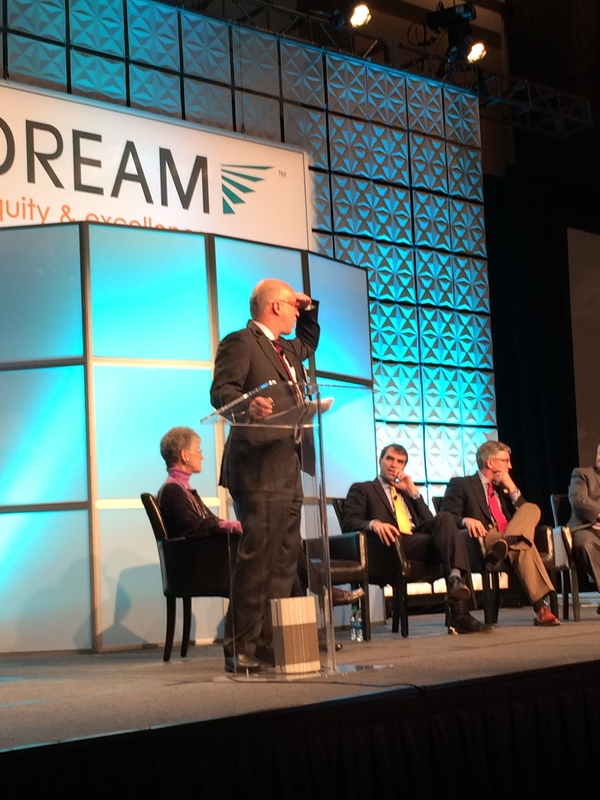 It is, in many ways, a metaphor, for all that our work advancing equity and opportunity in the South requires. The Underground Railroad speaks to me not just as a metaphor and as a literary work. It also is part of my personal story. 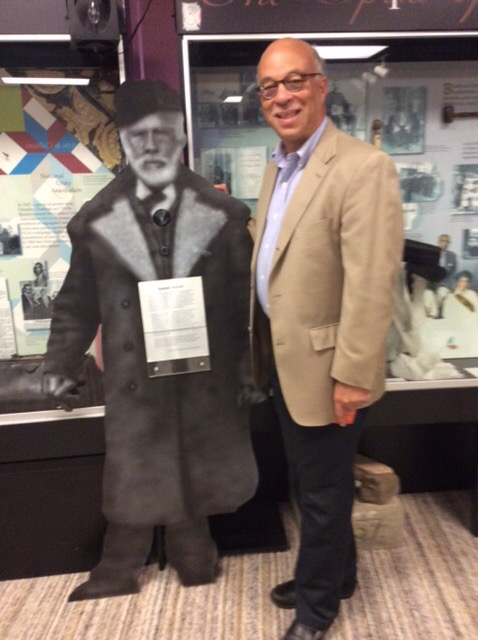 My great-great grandfather, Stanton Hunton, with whom I am pictured here at the museum dedicated to the Underground Railroad in Chatham, Ontario, used the actual Underground Railroad to escape slavery in Virginia in the 1840s. Stanton’s story is worthy of a novel, itself, including two unsuccessful escape attempts before he managed to achieve (the Promised Land of) Canada, put his skills as a brick mason and carpenter to work for himself, and start a family. His story was the beginning of the mobility story of my father’s family. Every family has a mobility story. And today the narrative of upward economic mobility and liberation is unquestionably dependent on attaining a postsecondary credential that prepares its holder to access, navigate, and advance within employment that offers meaningful, living-wage work. Like Cora and the Underground Railroad, the pathway from foundational education to a postsecondary credential to living-wage employment, even when brilliantly engineered, is fraught with pitfalls, trapdoors, headwinds, and rip-currents. Success in navigating the pathway requires the vigilant engagement of others at every step of the way, others who are committed to equity outcomes for each and every traveler. And while Cora’s story offers a tale of overcoming, it also offers a caution. The Underground Railroad was a beautifully engineered system for ushering people to freedom. But its engineering was compromised by a surrounding culture that was not supportive of and, in fact, often hostile toward, people making the journey. In the absence of a fully supportive culture, Cora’s success depended on a high degree of personal heroism on her part that exacted a very high cost. The best engineered strategy for success along the pathway to upward economic mobility will run aground unless it is supported by a reinforcing culture of equity across the institutions that touch it. Otherwise the burden of success requires an unreasonable level of heroism on the part of individuals trying to make their way forward. And the cost of heroism can be toxic. A few years ago, a deeply disturbing conversation ran across several issues of the alumni magazine of my college. Under the banner “My Classmates are Dying” was a dialogue carried out through letters to the editor of the alarmingly high, statistically significant rates of premature death by illness and even suicide of black men who had attended Yale College in the 1960s, when the university, an overwhelmingly white institution, began to open its doors seriously to men of color. (There were no women at Yale until the 1970s.) Death rates for African American alumni in the class of 1970 were three times that of whites in the same class. Scholars looking at these data and noting the physiological stresses associated with black men trying to advance in an often inhospitable culture made links to the phenomenon known as “John Henryism,” so named by the brilliant scholar of public health, Sherman James. According to legend, John Henry was one of the “steel drivers” who hammered down spikes used in the railroad expansion that made America big and rich. With the coming of the steam-powered drill, the livelihoods of the steel drivers like Henry were threatened. Henry, full of bluster, challenged the owner of the railroad to a contest pitting Henry against the new drill. Henry won the contest, but he died from the mental and physical strain. John Henryism reminds us of the unacceptable personal burdens that fall on underrepresented people trying to navigate a culture where a commitment to equity is not pervasive. The price of success can be a harrowing journey like Cora’s or even life itself like the pioneers before me at Yale. And it persists. Just last Sunday, the New York Times ran an article about first-generation Latino college students who were able to obtain Social Security numbers that would allow them to lawfully work, drive, and pursue an affordable postsecondary credential, through the Deferred Action for Childhood Arrivals program (DACA.) The title of the article, “The Only Way We Can Fight Back is to Excel,” hit me in the gut. Excel at what cost? Like Cora? Like the Yale men? We need less personal heroism and more equity and systematic support if the pathways we are dedicated to building are to deliver on their promise: Equity at every turn, for every individual on the path to opportunity. This work has existential importance for our young people and our institutions and our nation. Let’s let nothing stand in its way. Since its inception, the State of the South blog has examined patterns of economic mobility and educational progress across the region, looking at what demography and geography say about who is being successfully prepared for educational and economic success. In a new report commissioned by the John M. Belk Endowment, we applied this lens to the state of North Carolina—a state that prides itself on being a beacon: from creating the nation’s first public university and one of its earliest community college systems to pioneering the concept of research parks that bridge education and industry. But as we’ve seen across the South, far too many people in the state are struggling to make ends meet. Even in the most economically dynamic metros like Charlotte and Raleigh, people who grow up in low-income families are more likely to stay there as adults than almost anywhere else in the nation, and only small numbers make it to the middle- or upper-income levels despite thriving labor markets that seem full of opportunity. For young people born in the lowest quintile of the income distribution in Charlotte, for example, 38 percent will stay there as adults, another 31 percent will only move up one quintile, and just 4 percent will make it to the highest quintile. Upward mobility in 22 of North Carolina’s 24 regions called “commuting zones” ranks within the bottom quarter nationally—and Charlotte, Raleigh, Fayetteville and Greensboro rank in the bottom 10 of the nation’s 100 largest commuting zones. While mobility varies depending on where people live, only about one-third of children born into North Carolina families making less than $25,000 annually manage to climb into middle and upper income levels as adults. Latinos and African Americans are more likely than whites to be in poverty and attain lower levels of education, leaving them less prepared for high-skill, well-paying jobs—and those disparities will increasingly affect North Carolina’s economy as these populations grow to make up a larger proportion of the population. A family of one parent and one child needs an income of $21 an hour to cover basic living expenses in North Carolina, yet only 26 percent of full-time jobs pay median earnings of that amount. While there is significant variation in mobility levels across North Carolina, no part of the state meets the national average. These mobility patterns, paired with the rapidly changing demographics of the workforce, have significant implications for North Carolina. Gov. Pat McCrory’s postsecondary goal is to ensure that by 2025, 67 percent of North Carolinians will have education and training beyond high school. And there’s good reason for a goal like that: while 31 percent of North Carolinians who attain only a high school degree live in poverty, just 5 percent of people with a bachelor’s degree do. In order to meet the 2025 goal and the competitive demands of a 21st century economy with a skilled workforce, we need to reduce disparate outcomes in education along racial and ethnic lines. In Pitt County, educational institutions and economic development leaders are investing together to address needs of both the working population and industries, like the recent collaboration between Eastern Carolina University and Pitt Community College: the Biopharmaceutical Workforce Development and Manufacturing Center of Excellence. The center will link education and industry to ensure that residents looking to enter advanced manufacturing in health sciences are trained in the specific skills needed in Pitt County’s growing economy, attracting both workers and new industry. Wilmington’s Blue Ribbon Commission on Youth Violence used an assessment of local food insecurity, school dropouts, and gang violence, as well as a scan of community resources and organizations, to guide their decisions about how and where to act. The Commission of leaders from the faith-based community, private businesses, local nonprofits, and elected officials is charged with coordinating resources, with a focus on youth ages 0–24 and their families. The analysis informed the creation of a Youth Enrichment Zone, a geographical area in the city where they target programmatic activity and investment. commitment to providing adequate resources that support the common vision. Completion by Design. AACC Pathways Project. Complete College America. Achieving the Dream. If you’ve spent any time in the community college space, you’ve heard of these student success initiatives and several more. These are national initiatives, but there also are ones at other levels: regional (like RGV Focus in the Rio Grande Valley of Texas), statewide (like Virginia’s Developmental Education Redesign), and institutional (like Valencia’s Learning in Community, LinC). Most community colleges participate in overlapping initiatives along the education-to-career pipeline, focusing on topics such as college readiness, developmental education, retention, transfer, or connection to employment. When Columbus State Community College in Columbus, Ohio, decided to map the initiatives they are engaged in, they counted 52(!) student success initiatives. Some initiatives are embedded in course design, some require student self-selection (tutoring, supplemental instruction), and others target specific populations (TRIO). The initiatives were not aligned, each having their own goals and anticipated outcomes. Columbus State created an initiative assessment strategy last year, starting by collecting student-level data on initiative participation. Among their findings, they found that 96 percent of degree-seeking students participated in one or more initiatives. When considering success in coursework (C or better), the success rate for students who participated in only one initiative was 62 percent, compared to 71 percent for those who participated in five or more initiatives. The team plans to do a cluster analysis to figure out which initiatives working together have the highest impact on retention and graduation. The big takeaway from Columbus State’s effort: success interventions, when added together, make an impact on overall success rates. Navigating educational pathways can be difficult, especially for first-generation college students. Students transitioning from community colleges to four-year universities—through structured transfer programs or continuing on their own after degree completion—can often feel like just another number, lost in the masses of other students on campus. Historically black colleges and universities (HBCUs), which are smaller than most predominantly white institutions (PWIs), allow for smaller class sizes and provide all the social groups, extracurricular activities, and sports teams as larger PWIs, but with lower tuition. 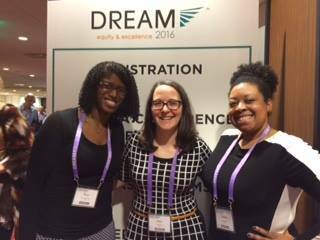 The MDC contingent at DREAM: Shun Robertson, Abby Parcell, and Jenna Bryant. At a DREAM session on Wednesday, current and former leaders of community colleges and HBCUs led the audience through a spirited discussion on the benefits of institutional partnerships, including a concrete outreach strategy for HBCUs to enroll community college transfer students. The panelists stressed the importance of going beyond basic articulation agreements by creating spaces on community college campuses for students to learn about four-year institutions, especially HBCUs. Bluegrass Community and Technical College (BCTC) designates office space on campus for Kentucky State University (KSU) advisors to meet with potential students to discuss the next step in their education plan. Bluegrass and KSU hold joint activities on the community college campus that involve faculty, advisors, and recruiters to help students think through the challenges they might face as they move on to a bachelor’s degree. This intentional partnership fosters a relationship between the students and KSU, making a careful handoff between the community college and KSU, easing the transition of the student to the new campus culture. More importantly, creating intentional pathways for students to advance along the postsecondary ladder of success takes institutions out of their silos and into a partnership where the students’ successful navigation of the educational system becomes the focal point. DREAM 2016 also featured the premier of “No Greater Odds,” a documentary that introduces five community college students at the College of Southern Nevada. The stories show the diversity of community college students, following individuals through early college, from a four-year university to the community college and back, and the journey back to college after a decade or more out of school. The production also displays the diversity of community college student skills, with student cinematographers, editors, and musicians. You can watch a trailer and learn about arranging a screening in your community here. 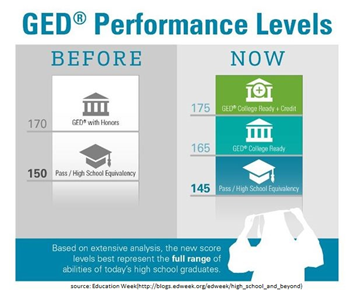 Last month, the GED Testing Service announced that they would lower the passing score for the equivalency diploma. Results from the latest version of the test, released in 2014, revealed both lower passing rates and that those who passed the tests were outperforming typical high school graduates in college courses. Since the test is meant to be equivalent to a high school diploma, the Service opted to change the passing score and recommended that states retroactively apply the new score. States are free to determine how they will apply the new policy. (North Carolina, for example, is opting for retroactive; that means almost 800 more North Carolinians will earn a GED.) In addition to the new pass score, the Service created two other cut scores: a college ready score and a college ready + credit score. They recommend students who receive these scores be excused from placement tests and/or remedial courses (college ready) or receive college credit in the related course areas. and postsecondary education and employment outcomes for GED graduates are less than traditional high school graduates. But alternatives like the GED are critical onramps for those who are not on a typical pathway to economic security—especially in the South where we have half a million young people who are disconnected from work or school. To create conditions for thriving Southern communities, we must encourage individual mobility that rests on a combination of personal drive, deliberately supportive institutional practices, community supports, and the eradication of structural barriers—especially for those who start out furthest from opportunity. They’ve also got discussion guides for educators, grantmakers, policymakers, and others who want to tackle these issues in their own communities. These discussions and relationships will be necessary to help young people—smart, persistent, gritty young people—who have a GED make their way to more education, employment, and economic security. When we talk about the future of work, we often look at the number of jobs likely to be created in aggregate, with special attention paid to entry level jobs for recent college graduates. The pipeline of labor and the strength of our economy are dependent on people believing that education has a great return on investment and that the investment increases the economic mobility of each generation—parents encourage their kids to go to college because they want them to do as well or better than they have. 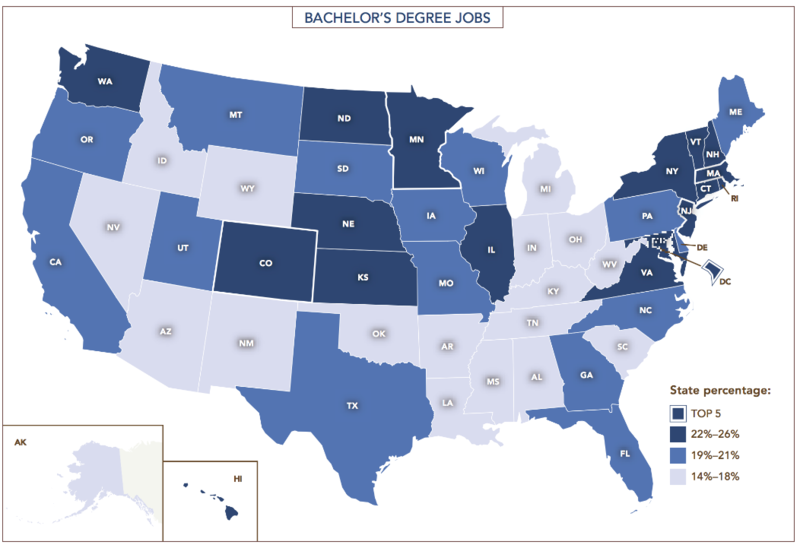 But in much of the South, too few jobs require a postsecondary education and allow for economic security. Arkansas, for example, added 40,000 jobs between 2010 and 2013 and the state is forecast to add 546,000 jobs by the end of 2023. Nearly 70 percent of current jobs are low-skill and only 30 percent of jobs require a postsecondary credential for entry-level employment. Low-skill jobs are also conflated with lower wages, producing a workforce that is unable to move up the economic ladder and generate significant economic growth through their consumption, investment, and tax dollars. In Arkansas, 87 percent of jobs that pay less than a family-sustaining wage are those that don’t require education beyond high school. Moreover, in 2013, 65 percent of the jobs in the state did not meet that yearly threshold of a family sustaining wage. Arkansas is not alone in this issue. The low-wage, low skill economy is an issue throughout the South. MDC called attention to the lack of well-paying jobs across the region in the State of the South report, and we are currently preparing a study of economic mobility in North Carolina that raises similar concerns about the low-wage jobs in our home state. 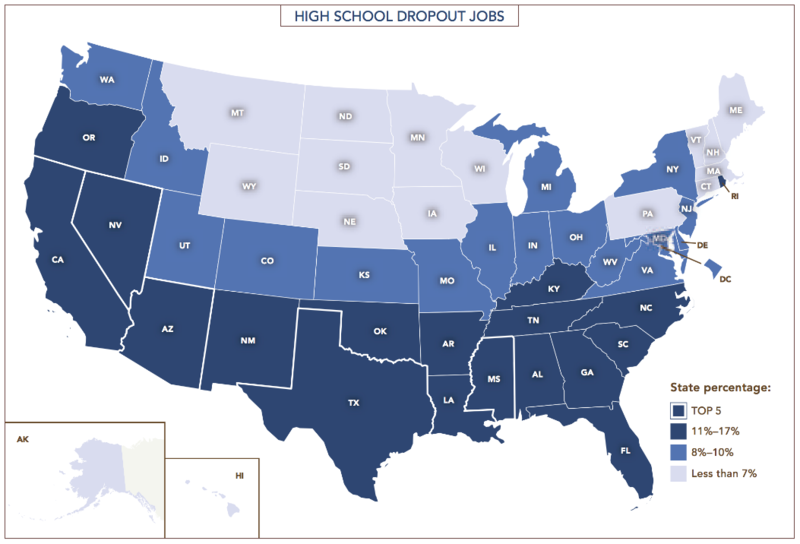 And as you can see from the maps below, the states with the most jobs for high school dropouts are in the South while the opportunities for growth for those with bachelor’s degrees are in the North and the Midwest. The Winthrop Rockefeller Foundation, headquartered in Little Rock, Arkansas, understands that career opportunities that pay family sustaining wages are important for the Arkansas economy, and that students need to realize the return on investment of postsecondary education within their home state. The Foundation wants students, parents, policymakers, educators, and employers to EXPECT MORE. The EXPECT MORE campaign asks people in the state to change the status quo by investing in the right advanced-skills training and education, investing in every region of the state to attract family-supporting jobs, and redesigning career pathways that offer family-supporting wages. The goal is to reverse the 70-30 equation (of jobs that require no postsecondary education for entry-level employment compared to those that do) through a series of strategies to transform the Arkansas public education system and build a pipeline of family-supporting jobs across the state. Check out more videos from the EXPECT MORE website to learn more about how Arkansans are building an Infrastructure of Opportunity for their future. You can join MDC and The Winthrop Rockefeller Foundation in a conversation about how Arkansans can make sure tomorrow’s jobs are better by live streaming the event today at 1:00 pm EST at the Clinton School of Public Service.